SW-Control Pro is a two channel controller for battery operated toys and small appliances. The SW-Control Pro unit may be used with any of the SimplyWorks transmitters to control toys, lamps, fans, or any battery operated equipment via a standard 3.5mm jack plug. 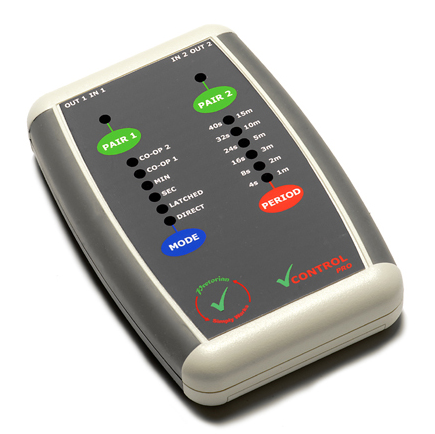 The SW-Control Pro has two independent channels and also benefits from two co-operative modes - press your switches at the same time to switch on the toy, or press one switch for 'on' and the other for 'off'. SW-Control Pro comes with two standard leads to connect to your toys etc and it can operate with both wired and wireless switches and any SimplyWorks transmitter and also features Direct, Latched, Timed (minutes and seconds) modes. Use it wirelessly with your own switches using one of the SW-Send interfaces.